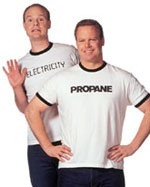 To readily recognize a leak, know what propane smells like. We have pamphlets available with a scratch-and-sniff spot so that your entire family can recognize the smell. Propane leak detectors, similar to carbon monoxide detectors, are available. call 440-439-4474 to obtain one. If you smell a leak, immediately evacuate everyone from the building and call The Gas House or the fire department from your neighbor's phone. DO NOT remain in the building, use the telephone or light switches or try to determine the source of the leak by yourself. When lighting a grill, keep the top open. 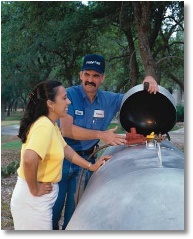 Before connecting the cylinder to a propane gas grill burner for the first time, use a leak-detection solution (a 50/50 mixture of water and liquid soap) to check connections for tightness.